When I was a kid first getting into Warhammer, Chaos armies used to be eclectic collections of all sorts of weird and wonderful creatures. Beastmen marched to war beside hunchbacked Chaos Warriors, enigmatic Chaos Champions and outlandish Daemons that were only available via mail order! Chaos is at its most magnificent when it is truly undivided. The opportunity to take wildly divergent units and unite them with a strong colour scheme is the perfect hobby challenge for me. So this time I’ve been working on some Bestigor as a bodyguard for my Great Bray-Shaman. Most people paint their Beastmen with rusted and corroded battlegear, as if scavenged or primitively made. I’ve painted mine in the same shimmering bronze as my other Tzeentch aligned units. Although they aren’t how I picture Tzaangor to look (that requires a lot of modelling putty), I like how they fit into the rest of the army. I imagine that their loyalty to my Chaos Lord has been bought with the newly forged armour that they wear. By contrast their foe-rending Great Axes are worn and dulled with the blood of countless battles. I painted their tabards in the same blue as the Runeshields on my Chaos Warriors and chassis of my Chaos Chariot. I’m pretty happy with how these guys turned out and will be adding the command group next! From the dark heart of his forest lair steps the Great Bray-Shaman. This malign prophet of Chaos has a soul as black and twisted as the benighted realm he heralds from. When The End Times: Glottkin came out I was pretty happy that you could build an army using all of the Chaos factions. 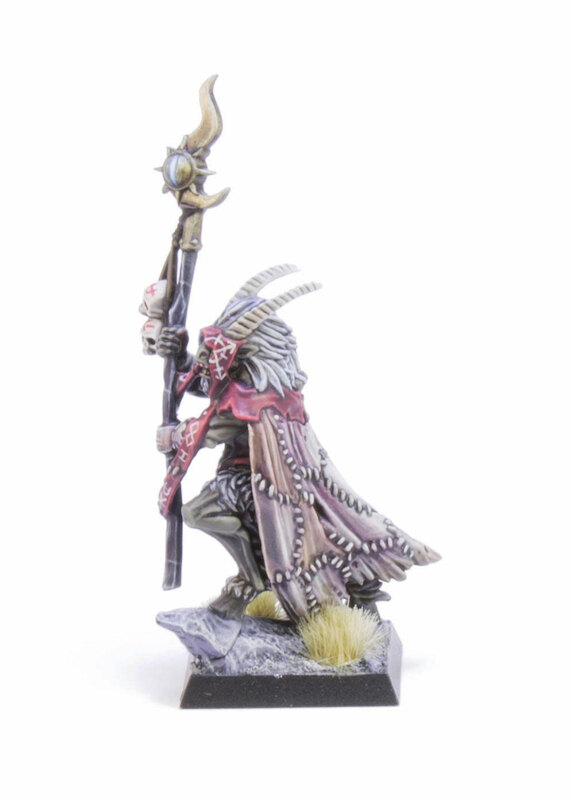 The Beastmen have some great models including this guy, the gnarled Great Bray-Shaman, and I was glad to have an excuse to add him to my collection. I painted him up in the same magenta that I used for the wizards and heroes in the rest of my army. I converted his staff with an icon of Tzeentch from the Burning Chariot kit, the eye of which glows blue with clairvoyant power. If you look closely you can see blue Object Source Lighting from the baleful eye glaring out from beneath his hood. I freehanded runes onto his hood, inspired from designs found on the Chaos Warshrine. Here’s a better view of the Chaos Star over his left eye. I glazed his cloak with Reikland Fleshshade and Druchii Violet to create a patchwork of flayed skins. I really pleased with how this model came out. To me he’s a real throw back to the creepy old 80’s artwork from Slaves to Darkness and the Lost and The Damned. 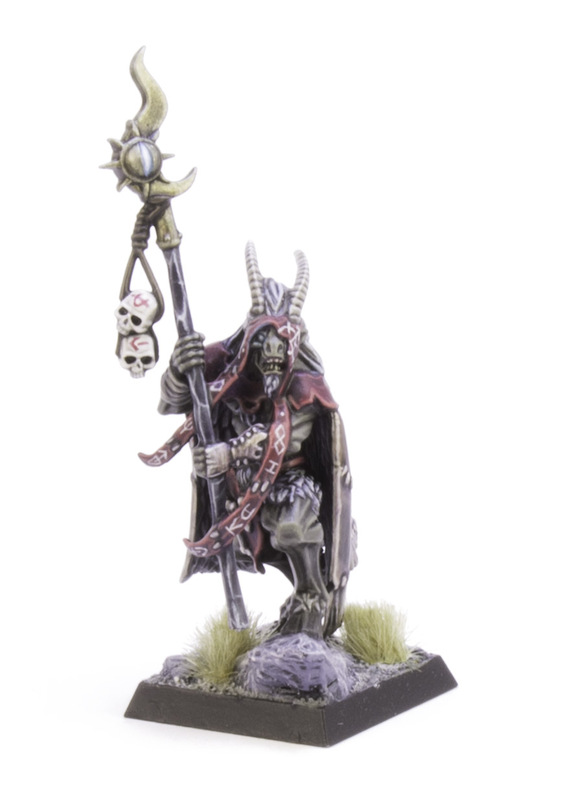 In fact I enjoyed painting him so much that I got a unit of Bestigor bodyguards for him too – more to follow! What do you think of him – tell me in the comments below!